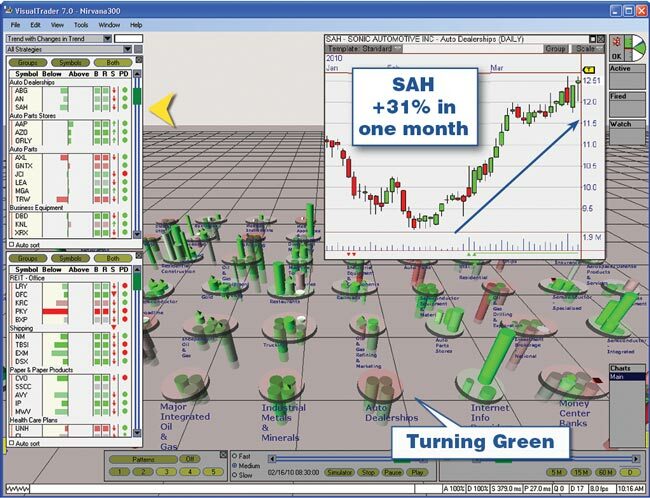 Gxtrader was created to give you trading ideas while helping you see the big picture. The Market Map shows you a dynamic picture of the overall market. This easy to use graphical representation of the market can show you momentum building as it happens. For example you can set Change in Trend to render as a color; this way consensus quickly becomes obvious to you, making it easier to gauge the overall direction of the market. This overall direction is made even easier by the leading indicator which visually and audibly tells you when the market is moving by displaying measurements across the entire map. These big picture, graphical indicators are just part of your power with gxtrader. We hope adding this big picture view will help you turn even the small trades into big ones.